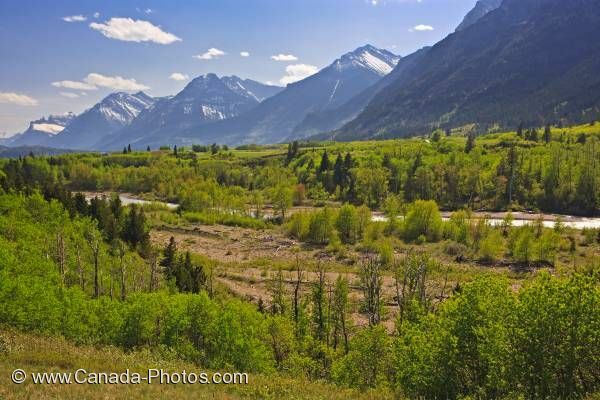 The scenic view of the Blakiston Valley in Southern Alberta, Canada with the Blakiston Creek flowing in the middle of the wilderness. The Blakiston Creek flows amongst the wilderness of the Blakiston Valley in Waterton Lakes National Park in Southern Alberta, Canada. High snow covered mountain peaks tower above the Blakiston Valley as if they keep watch over the valley landscape. Blakiston Creek running through the Blakiston Valley in Waterton Lakes National Park, Southern Alberta, Alberta, Canada. Picture of the Blakiston Valley in Southern Alberta with snow covered mountain peaks creating a beautiful backdrop.